Mosquito nets are hot, rip easy, and are difficult to enter and leave without damaging them, normally the ones supplied by hotels have holes. Putting screens on windows and doors is the answer to Malaria, not mosquito nets, 10 times more comfortable and people do not need to be convinced to use them. I covered the window with a piece of mosquito net, the bag hanging on the window is my shower bag. I carry a piece of mosquito netting about five feet by five feet, it will cover most windows in hotel rooms. I stuff it into the windows and often I use packing tape to cover the joints. Note, if possible do not use tape, and for sure do not use duct tape as this will adhere too well and cause problems for the paint in the room. 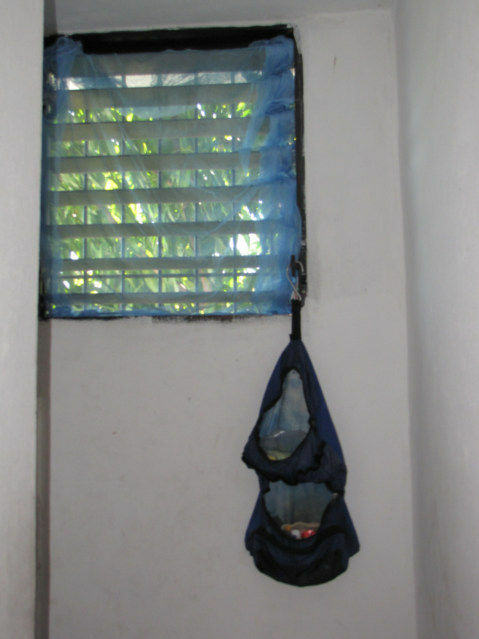 Note, I always carry a proper mosquito net, because I do stay in super cheap hotels or I am sleeping on the roof, or just under a roof with no walls, mine is made to be used with a hammock.